For starters, be sure you’re ready for red hair coloring. If you’re naturally a light to medium brunette and have relatively fair skin, you’re set. 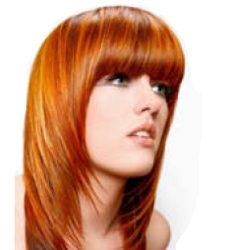 However, steer clear of red hair coloring if you have yellow or orange undertones to your skin. “The color and skin tone will compete and make you look like a big red tomato,” warns Stanko. Keep in mind that this season, red hair coloring shades are all about single process color. “You’ll want an awesome, bangin’ red that makes a strong statement, for this season,” he says. “We Set the blondes have the dimension and the brunettes have the mysterious flecks of gold. But for red hair coloring, you need a great, even color from scalp to tip.” For more great hair color ideas check out our Pinterest Hair Coloring Ideas Board. December 27, 2012 By: Paul Lynn Leave your comments (2), Your input matters. Ashlee Simpson has been known to get her hair cut by many celebrity hairstylists including Ken Paves, a hairdresser who famous for styling Jessica Simpson’s hair. A haircut at one of his salons costs $125 and up. You can check out all the details and the salon’s website here. You can save a lot of money by simply bringing the photograph to a hair salon near you. An experienced hairdresser will be able to cut your hair in the same fashion and even make recommendations and adjustments to the hairstyle depending on your hair type. Pictures are a wonderful way to ensure that you are both on the same page.